The Vancouver Canucks have lost Brandon Sutter for the rest of the season, after announcing the forward will undergo sports hernia surgery on his right side. He is expected to be out for six to eight weeks, which would rule him out from playing again in 2018-19 unless the Canucks make it deep in the playoffs. Sutter already underwent hernia surgery on his left side in 2015 and has missed nearly a month for the Canucks already, last suiting up on February 9th. Sutter has been a disappointment since being selected 11th overall by the Carolina Hurricanes in 2007. The 30-year old forward now has just 260 points in his 683-game NHL career, and never even truly became the lock-down defensive center that some believed he could be. For the Canucks he has recorded just 37 goals in 188 games but still has two years remaining on his contract at an average annual value of $4.375MM. He’ll finish this season with just six points in 26 games. While the team hasn’t expressed any indication as to their plans this summer, Sutter is an interesting player to watch as the Canucks prepare to compete next season. His full no-trade clause changes into just a 15-team list, while there is also some buyout potential with just two years left on his deal. Vancouver has three center spots locked up with Bo Horvat, Elias Pettersson and Jay Beagle, and may want to move on to a younger option for the fourth. There is also the issue of his effectiveness next season even months removed from surgery, as hernia operations often have lingering effects on NHL players. If a buyout is considered at all, Sutter would have to be fully healthy. I’m totally confident… I think it’s about your effort, the way you take care of yourself on and off the ice, and at the end, it’s going to be a battle. But if you’re strong enough, you’re going to be able to do it… It’s a fact that this knee will be stronger than I’ve ever experienced. The rest of it is up to me. The typical recovery time for this injury is six to nine months and especially for a soon-to-be-36-year-old, the latter end of that timeline seems more likely. However, Koivu has never given anyone a reason to doubt his dedication and work ethic, so his own optimism means a lot. Some thought that this could be a career-ending injury for the respected veteran; he merely sees it as a minor setback. The Colorado Avalanche have all but confirmed that they won’t be major buyers at the trade deadline, but they might have a hard time being sellers too. The young team is not looking to move their long-term investments nor the players needed to win down the stretch and few good other rental options exist on the roster. The one player that does stand out as a valuable rental target is forward Colin Wilson, who has redeemed himself this season after an abysmal first year in Colorado. Wilson is a versatile, veteran forward who can be a major boost to a contender’s bottom-six. However, he’s also now on the injured reserve. CapFriendly reports that Wilson has been moved to the IR by the Avs with an undisclosed upper-body injury. The requisite ten days on the IR will give Wilson at most two games to show that he is healthy, if he is even ready to play by then. This could make it hard to the Avalanche to shop their most prized impending free agent. The injuries continue to pile on for the Vancouver Canucks, as Chris Tanev has also joined the injured reserve. While the Canucks were happy to get starting goalie Jacob Markstrom back last night, Tanev is the latest in a long list of injuries, including Sven Baertschi, Alexander Edler, Thatcher Demko, Brandon Sutter, and Jake Virtanen. Of that group, only Virtanen has managed to stay off the IR. The Canucks are expected to get center Brandon Sutter back this week, reports TSN 1040’s Jeff Paterson (Twitter link). He has been out of the lineup since suffering a separated shoulder back in October and will give Vancouver some extra depth down the middle as well as some help at the faceoff dot as he has averaged better than 50% on the draw in each of the last four seasons. However, the Canucks have a full roster at the moment and their two waiver-exempt forwards (Elias Pettersson and Brock Boeser) clearly aren’t going anywhere. With that in mind, they will need to make a roster move (likely a trade or a waiver placement) in the very near future in order to be able to activate Sutter. Vancouver begins a two games in two nights stint on Wednesday in Ottawa. In an appearance on Sportsnet 960 (audio link), Calgary GM Brad Treliving indicated that the Flames will be without defensemen Juuso Valimaki and Michael Stone for a while yet. Valimaki has been out since late November with a high ankle sprain and the rookie is targeting the end of the month as a timeline for his return. Meanwhile, there remains no timetable for Stone’s return to the lineup from the blood clot that has caused him to miss the last 18 games and counting. Kings winger Carl Hagelin is about a week away from returning to the lineup, notes Robert Morales of the Los Angeles Daily News. He has only suited up in five games since being acquired from the Penguins in mid-November due to an MCL sprain. While Los Angeles has an open roster spot to put him on the roster, they will still need to free up some salary cap space in order to activate him off LTIR. The pending UFA has just a goal and four assists in 21 games this season but his speed will make him an intriguing asset to a playoff team looking to add some depth between now and the trade deadline. With the holiday season now here, PHR continues its look at what teams are thankful for as the season heads towards the midway mark. There also might be a few things your team would like down the road. Let’s take a look at what’s gone well in the early going and what could improve as the season rolls on for the Vancouver Canucks. Click here for the other articles in this series. What are the Canucks most thankful for? Many people had the Vancouver Canucks listed to be among the two worst teams in the NHL this season after an offseason that saw stars Henrik Sedin and Daniel Sedin both retire, leaving the team with a nucleus of young players. While some of those players like Bo Horvat and Brock Boeser were expected to lead a new wave of talent, few expected Vancouver to be a competitive team this season as many felt the franchise had a chance to compete for the No. 1 overall pick this season. Halfway through the season and Vancouver is far from one of the worst teams in the league. In fact, the Canucks are actually one point away from a wild card spot as the team carries a 19-18-4 record for 42 points, just a point behind the Dallas Stars. While it’s a long season and much can change, the Canucks have shown the ability to play well as a young group with a sprinkling of veterans throughout their lineup. Who are the Canucks most thankful for? 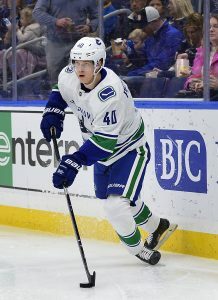 While Boeser looked like the star of the future and continues to put up solid numbers, the team got the star power they needed, much quicker than they expected as Elias Pettersson has dominated in his rookie campaign and looks like an obvious choice as a Calder Trophy candidate, barring injury of course. The 20-year-old had an impressive season in the SHL last season, breaking numerous records and while the team had planned to ease the rookie into their lineup, Pettersson has had other plans. He has 19 goals and 39 points in 35 games, good enough for a point per game production and looks to be the face of this franchise for many years. What would the Canucks be even more thankful for? While the team has had quite a bit of success from a number of young players, including Nikolay Goldobin, Jake Virtanen and recent addition Josh Leivo, several of their veteran players have been hampered by injuries and have seen little action this season, including Sven Baertschi, Jay Beagle and Brandon Sutter. Baertschi finally returned to the lineup Saturday after being out since Oct. 24 with a concussion. Beagle missed almost two months of the beginning of the season and is only now earning solid minutes after the team handed out a four-year, $12MM deal to him this summer. Sutter has yet to return to the team after suffering an upper-body injury in October. Combined the three players have played a total of 41 games combined. If the team can get some consistency from those veterans, that should only help the team fight for a potential playoff spot. What should be on the Canucks’ Holiday Wish List? The team needs defense and are salivating while watching the World Junior Championships as defenseman Quinn Hughes, the team’s first-round pick (sixth-overall) in the 2018 draft has dominated and looks to be ready to join the Canucks immediately after his season at the University of Michigan ends. Scouts say that Hughes should make an immediate impact once he arrives and with the struggles of former top defensive prospect Olli Juolevi up in the air (he’s out for the season after undergoing knee surgery), Hughes should be able to walk in and take over quarterbacking the power play and providing some offense from the blueline, something that Vancouver has struggled to do the last couple of years. According to Rick Dhaliwal of Sportsnet, the Vancouver Canucks will be recalling Darren Archibald from the minor leagues. Though superstar rookie Elias Pettersson returned with a bang, the Canucks lost Brandon Sutter to injury last night and needed another forward to fill out the roster. Sutter will be out “weeks” with an upper-body injury, giving Archibald another chance at the NHL. Brendan Gaunce is also on his way up for the Canucks according to Patrick Johnston of the Vancouver Sun. Torey Krug has been activated from injured reserve and will be back in the Boston Bruins lineup tonight, while Urho Vaakanainen has been swapped to take his place on the shelf. The latter suffered a concussion when hit in the head with a Mark Borowiecki elbow, and is still out indefinitely. Krug meanwhile hasn’t played at all this season and will offer the Bruins some much needed experience and puck-moving ability on the back end. Eric Gryba has been sent back to the minor leagues by the New Jersey Devils, as they activate Ben Lovejoy from injured reserve. Gryba can go straight to the minors since he cleared waivers earlier this month, and played only two games on his recent call-up. Lovejoy’s return comes after a near two week absence following a lower-body injury suffered on October 18th. Sven Andrighetto has ended up on injured reserve for the Colorado Avalanche, giving them cause to recall Sheldon Dries and A.J. Greer from the minor leagues. Andrighetto suffered a lower-body injury just a few games after his most recent return from injury, and will now spend even more time on the sidelines watching the Avalanche compete for a playoff spot. Alex Edler, Bo Horvat, Brandon Sutter and Chris Tanev form our leadership group as alternate captains, supported by a wider group of veteran players. Our team culture will be built from leadership by committee. It will be a big part of our process and our identity each and every game. There are several teams around the league that will operate this season without a captain, and the Canucks faced no rush to name one for this upcoming season. Though many believe that Horvat will eventually take on the role given his natural leadership abilities, heaping that responsibility onto his shoulders before a season where he will be asked to bear a huge load might have been too much to ask. Without Sedin in the mix, Horvat will be the unquestioned number one center on the Canucks and is a key part of an evolving offense that has both extremely talented young players and a lot of question marks in their top group. Edler’s name is interestingly listed first in the release, despite him only being under contract for the upcoming season. Scheduled to become an unrestricted free agent in the summer of 2019, there hasn’t been much reporting over whether he’ll sign an extension with the team or be used as trade bait later on during the year. He and Tanev both are potential trade chips that the team could flip to add more assets in the age range of the core of the roster, but will serve as the experienced voices in the room for the time being. Much of the attention that has come towards the Vancouver Canucks this offseason either fell to their plethora of prospects, many of which seem to be ready to contribute next season, or their highly criticized signings of Jay Beagle, Antoine Roussel and Tim Schaller on the first day of free agency (not including the resignation of Trevor Linden). Regardless, The Athletic’s J.D. Burke (subscription required) writes that forgotten man Brandon Sutter’s stock is definitely heading up this season. The 29-year-old forward has provided the Canucks with a physical and defensive presence, but hasn’t been required to show his offensive skills. Suddenly, with scoring becoming a great team need and the addition of players like Beagle, Roussel and Schaller, the opportunity to play a more offensive role is suddenly in front of him. One suggestion is to have Sutter center the team’s second line with Elias Pettersson playing next to him to start the season. Then once, Pettersson has adjusted to North American play, allow the two to switch places. After signing a one-year deal for $5.25MM this morning, Vegas Golden Knights center William Karlsson remained positive about staying in Las Vegas long-term, according to Jesse Granger of the Las Vegas Sun. He hopes he can duplicate the 43-goal season from last year, which should hand him the long-term deal he wants when he goes through restricted free agency again next season. “In an ideal world I would’ve liked a long term deal, but I like to bet on myself and that’s what this is. Now I can go prove myself,” Karlsson said. The Athletic’s Kent Wilson (subscription required) writes that the Calgary Flames made a poor move last offseason when they signed defenseman Michael Stone to a three-year, $10.5MM deal. The veteran defenseman was thought to be a top-four defenseman, but once the team added Travis Hamonic via trade, Stone was sent to the team’s third pairing and truly struggled last year. Now, with $7MM remaining on his deal over the next two years, Stone stands in the way of multiple young defenseman, including Rasmus Andersson. With little trade value, things could get ugly at some point in the next year. In another tweet, Granger interviewed Vegas Golden Knights general manager George McPhee about the talent at the forward position. The team added center Paul Stastny, but lost two quality players in James Neal and David Perron. Despite the losses, the team has several in-house candidates like Alex Tuch and Tomas Tatar ready to step up. “I like where we are, but if there’s an opportunity to upgrade at the forward position at any time over the next year we will,” McPhee said. The Department of Player Safety announced they have fined Columbus Blue Jackets’ defenseman Ian Cole $5,000, the maximum allowed by the CBA, for a dangerous trip on Vancouver’s Brandon Sutter on Saturday between the two teams. The 29-year-old blueliner was given a two-minute minor for the incident. Cole was suspended for three games back in 2012 for an illegal hit to the head. Cole was acquired at the trade deadline from the Ottawa Senators after they picked him up from the Pittsburgh Penguins days before. He has fit in nicely to the team’s lineup, but while there are rumors that Columbus has been discussing an extension, there is concern that the Blue Jackets might not be able to afford his pricetag as he will be an unrestricted free agent this summer. He has five goals and 15 assists this season. Vancouver hasn’t had much luck with the injury bug as of late with Bo Horvat and Sven Baertschi, two-thirds of their top line, going down recently. The bad news continued Friday as the Canucks announced (Twitter link) that defenseman Chris Tanev will be out two-to-three weeks as a result of a groin strain. That is undoubtedly a big blow to their back end as he logs nearly 21 minutes per game of ice time while playing a shutdown role. Alex Biega will likely draw into the lineup as his replacement but he hasn’t seen any action in more than three weeks. Canucks head coach Travis Green also provided further updates on a couple of players. Center Brandon Sutter is still seven-to-ten days away from returning from his upper-body injury while blueliner Erik Gudbranson is the closest to returning; he has been out with an upper-body issue of his own since November 22nd. Mika Zibanejad’s return to the lineup will have to wait a little while longer. The Rangers have ruled him out of their next two games, reports NHL.com’s Adam Kimelman via Twitter. The plan is for the center to practice on Monday and then the team will re-evaluate his status from there. Zibanejad last played on November 26th and has been dealing with concussion-like symptoms since then but he still sits third in team scoring with 22 points in 24 games. Capitals winger T.J. Oshie took part in a partial practice today but will not suit up tomorrow night against Anaheim, reports Callie Caplan of the Washington Post. As a result, he’ll miss his sixth straight game. From the same report, defenseman Brooks Orpik is dealing with an upper-body issue. He’s set to be re-evaluated tomorrow but it seems likely that he will also miss Saturday’s contest. Washington doesn’t have enough salary cap space to call anyone up but they have one extra defender on their roster so they still should be able to ice a full lineup. The Vancouver Canucks were dealt another blow today when it was announced that Sven Baertschi will miss four to six weeks with a broken jaw. The young forward won’t need surgery, but it is still a huge chunk of the season to miss right as the Canucks are trying to prove they’re more than just a hot start. The team is already without Bo Horvat for some time, and are still trying to get Brandon Sutter back into the lineup. While Brock Boeser does his best to keep the offense moving, other players will need to step up both at even-strength and on the powerplay. Another upstart Canadian Western Conference team will be without one of their most important defenders for the next few weeks. Winnipeg Jets defenseman Dustin Byfuglien is out “week-to-week” with a lower-body injury, with a post-Christmas return the hope at the moment. In his absence, Tucker Poolman will get back into the lineup and try to prove why he was so heralded coming out of the University of North Dakota. The Jets have seven games before the Christmas break, and ten left in the month of December. The Anaheim Ducks have perhaps faced more injury turmoil than any other team this year, but are starting to get health. As Eric Stephens of the Orange County Register reports, Ryan Getzlaf and Jakob Silfverberg are likely to return up front tonight. With Ryan Kesler also nearing a return, the Ducks should be feared in the wide open Pacific division.